Painting black hair for the first time may compel the novice into reaching for the black tube of oil paint and illustrating each strand with a fine line. The resultant portrait may appear to have had a transplant of black wires emanating from the scalp. How can the artist paint black hair convincingly? Before making changes, the portrait artist needs to address the mistakes when painting dark hair. The following malpractices are often to blame for dark hair in portraits that look artificial or unconvincing. Using only black pigment to illustrate dark hair and then expressing highlights by using white. Leaving tonal bands in the hair from crown to tip due to poor blending, suggesting a corrugated texture rather than that of hair. Over-blending the tonal divisions of the hair until the hair looks more like one solid object rather than one of separate strands. 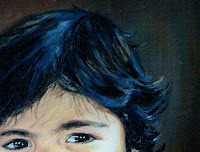 Not rendering shadows beneath hair, such as around the brow and temples, making the hair appear transplanted onto the face and leaving the portrait painting incoherent. Using too much blue in the highlights of dark hair, making it appear artificial. How to Paint Dark Hair in Portraits. The secrets to painting convincing dark hair in portraits can be found when adhering to the following practices and ideas. Cobalt, violet, mauve, smoky grey, midnight blue, chestnut brown, sepia and amber. Not every black hair is the same black. Some blacks are slightly bluer or browner than others. It is important to look closely and observe the colour shifts within each head of black hair, be it African, Chinese, Asian or even Caucasian. I would bin the black paint or reserve it only for the pupils of the eyes. I’d rather mix my own blacks from existing pigments. Rich, more interesting blacks can be obtained by mixing all three primary colours together and in varying quantities. More on this below. The highlights in black hair are often not simply blue or grey but other colours or variants on these colours. Different blacks exist in hair, from warm blacks to cool blacks. The following oil painting mixes will result in a diversity of blacks that may surprise the artist. Burnt sienna and ultramarine will result in a soft, smoky black. Permanent rose, pthalo blue and burnt umber will result in a sharp but warm black. Burnt umber and pthalo blue will result in a cold, dark black. Burnt sienna and pthalo blue will result in a coffee-tinged black. Permanent rose, ultramarine and burnt umber will result in a violet black. It is also important to observe the texture of black hair, which is often sleek but can be frizzy. Blend highlights into the next tonal gradation by using a soft clean sable. Oil painting glazes can be used to achieve a high finish. This entails applying a series of thin paint glazes, the upper glaze providing a smoother finish to the last. Observe also the contours of black hair which can be wavy or straight. Move the brush marks in the direction of the hair growth. Illustrating shadows beneath the hair, as cast on the brow, cheeks or temples will make the hair look as though it belongs to the face rather than cut-out and stuck on. Black hair is after all the ultimate in tone, as can be seen on afro-Caribbean hair, African hair and Asian hair. Pay attention also to any flyaway strands from the main body of the hair. This will provide the outline to the portrait. I use a fine sable to illustrate selected strands of hair (not every hair). Some of the strands may be paler than others, not merely black. Highlights may catch some and provide focal points for the painting. It is all about close observation.